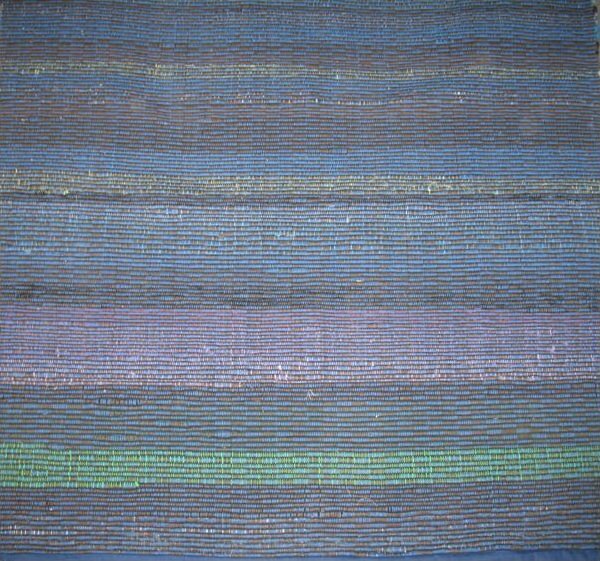 All shades of blue , accented with violet and other deep colors seen in seen in Amish men's shirts and women's clothing were incorporated into carpet rolls. Uncommon and wonderfully mysterious, they appear almost monochromatic from a distance, but actually the colors are arranged in horizontal bands about 1" wide that give the group a subtle banded pattern. All the colors are visible at selvege edges. Factory fresh untouched condition. Three huge long rolls available; would prefer to keep them together so they could be joined into one room size rug about 9' wide, which we can have sewn together for you at an additional charge.